Haven’t planned for Valentine’s day in Birmingham yet? Are you a last minute planner? Don’t worry! Because your beautiful city of Birmingham has already done the planning for you! If you and your sweetheart are looking for a classic Valentine’s Day out on the town, OpenTable has made making a reservation easier than ever! Simply pick how many people, the date, time and presto! OpenTable gives you a list of restaurant in your area that have an available reservation just for you! Keep this one in mind for every date night, night on the town, or even just a quick bite because OpenTable is available year round! If you and your sweetheart are thrill seekers and maybe favor Halloween over Valentine’s Day, then Warehouse31 has the perfect event for y’all! Their Bloody Valentine Haunted House is Birmingham’s only Valentine’s Day themed haunted house and runs from February 12th-14th. They even offer a Couple’s VIP package which includes fast passes to the front of the line, 2 free beverages, 1 free popcorn, and a photo in their Photo Booth! This option may not be for everyone, but hey, who doesn’t like to try something new! If you’re wanting to really show your Valentine just how much they mean to you maybe it’s time to do something really over the top. 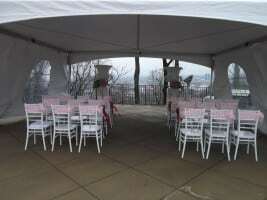 Vulcan Park & Museum is offering the chance to Say I Do With A View. Invite your 30 closest friends and family and marry or renew your vows with your best friends. The day includes a 30 minute intimate ceremony as well as cake, hors d’oeuvre, a keepsake bridal bouquet and boutonnière, and even a night stay at a local Birmingham hotel that night if you opt for the Sunset package! What better day to say “I’ll love you forever” than the one day of the year centered around love. Discover your animal instincts with “Woo at the Zoo” on February 13th as they discuss “love” in the animal kingdom. The Zoo will be serving wine and desserts along with special presentations about animal courtship! More information and tickets are available here.